Ruth Anne Dodge Memorial- "Black Angel"
The statue atop the bluff just outside the entrance of what was known as “the old burial grounds” has been a source of fascination since it was erected. Part of the allure is who sculpted it. Daniel Chester French also created the famed seated Abraham Lincoln inside the Lincoln Memorial in Washington, D.C. and the minuteman in Concord, Massachusetts. The fact that the concept of the angel came from a vision experienced by Mrs. Dodge during three nights preceding her death adds a captivating supernatural component. Tales of the angel flying off her pedestal at night or of her eyes following a person as they walk past are unsubstantiated at best. What is true is the solid bronze winged angel is quite likely Council Bluffs’ most valuable artistic treasure and is on the National Register of Historic Places. In 1916 Ruth Anne Dodge described to her daughters a dream in which she was on a rocky shore and through the mist saw a small boat approach. At the front of the boat a beautiful angel held a small bowl and spoke softly, encouraging Mrs. Dodge to take a drink. Twice she refused, the third night she drank, reportedly feeling like a she was “transformed into a new and glorious spiritual being. A short time later she died. On her deathbed she told her daughters the angel had given her the water of life, and she now had immortality. Her daughters commissioned French to create a memorial to Mrs. Dodge based on her description of this dream. 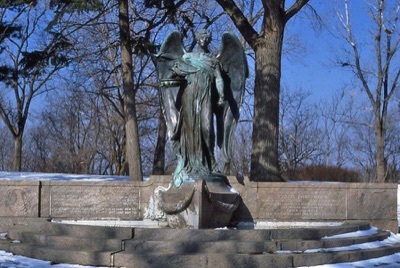 The statue was dedicated in 1920, depicting a winged angel with one arm outstretched and the other holding a vessel from which water flows. You can see the Ruth Anne Dodge Memorial at the top of North Second Street in Council Bluffs, just east of the entrance to Fairview Cemetery. Visit our Facebook page for more Council Bluffs tales and photos.